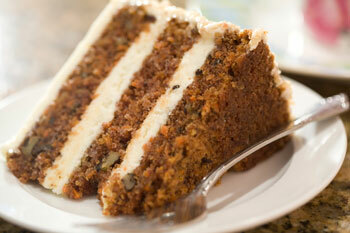 Moist carrot cake layered with cream cheese frosting. Spray two 8-inch round cake pans with nonstick cooking spray and set aside. In large bowl, beat the sugar, oil and eggs until creamy. Add ¾ cup sour cream and 2 teaspoons vanilla; beat until well-mixed. Add flour, baking soda, cinnamon, salt, and nutmeg. Beat on low speed until mixed. Beat on medium speed for 1 minute. Stir in the carrots and nuts. Pour the batter evenly into the pans. Bake for 20 to 30 minutes or until toothpick inserted into center comes out clean. Cool in the pans for 10 minutes. Remove the cakes from pans onto cooling racks; cool completely, about 1 hour. Meanwhile, In a medium bowl, combine butter, cream cheese, vanilla extract and powdered sugar. Beat on low speed until mixed. Beat on medium speed until smooth and creamy. Place 1 cake layer, rounded side down, on a serving plate. Spread about 1/2 cup frosting over cake. Place second layer over frosting, rounded side up. Repeat with third layer. Frost the sides and top of the cake. Store covered in refrigerator until serving.